What does your social media holiday campaign look like? It’s not easy coming up with an innovative strategy every time the holidays roll around, but the season's one of the best times to express the core values of your business. With that said, here are three brands which implemented effective social media holiday campaigns, along with some key notes on why they resonated so well. Doing something generous for your customers is one of the best ways to build brand awareness - because happy, grateful customers tend to want to share how they feel about a business that cares about them on a personal level. 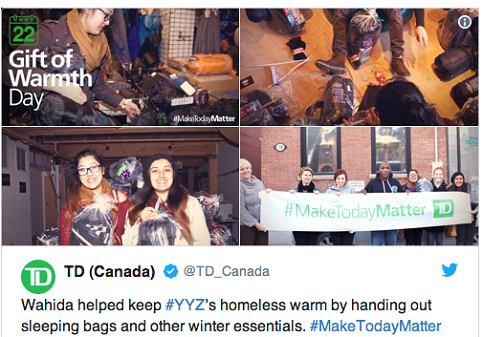 That was the impetus behind TD Bank’s #MakeTodayMatter social media campaign, which was built around the principle of customer appreciation. TD bank launched its campaign in November, before Thanksgiving and other major winter holidays, and the idea was simple. The bank enabled people in the community to submit great ideas for projects that would help people less fortunate. Those chosen would then have 24 hours – and funding – to make those projects a reality. And because TD Bank launched its campaign around Thanksgiving, the theme was quite obvious to everyone: giving is better than receiving. Whether community members handed out blankets and sleeping bags to the homeless, or built a wheelchair ramp for a local facility, the campaign resonated. In fact, the #MakeTodayMatter social media has had more than five million views. So what’s the takeaway? First, TD Bank’s theme was directly in line with the theme of the holiday, so there was no confusion why they launched the campaign. Second, the company gave the power to its customers, which boosted the perception of TD Bank’s involvement in the community. Lastly, the campaign helped alter customer perception of TD Bank, and turned it into a living, breathing business that cared. Budweiser is pretty well-known brand, but its campaigns were not capturing the imagination of the coveted Millennial customer, who love to think of themselves as hipsters. So the company launched a holiday social media campaign titled #HolidayBuds, in which everything old became new again. To appeal to Millenials love of nostalgia, Budweiser issued limited edition bottles from 1918, 1933 and 1969 just for the holidays. And to ‘retro’ things up even more, the company made 10,000 vintage wooden crates of 18 bottles of beer that were wrapped in packaging from eras like Prohibition and the Centennial. 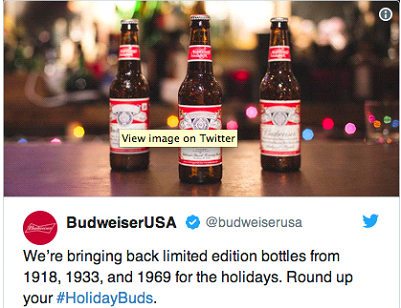 Budweiser then went on a social media blitz, urging everyone who bought the vintage beer to post photos on Twitter, Facebook and Instagram with the hashtag #HolidayBuds. The idea was to not only tap into Millennial nostalgia, but to get them to share their beer in social situations. The campaign worked because it was focused on an audience that Budweiser had targeted as vital to its future. The company also cleverly used the holidays to go retro, which enabled it to draw on its rich history. Budweiser also understood that beer and holiday fun were an easy thing to promote, so encouraging people to post pictures of their beer was something the company knew would gain traction - especially because people who bought the limited edition cases would want to share it with family and friends. The biggest takeaway in this campaign is that you can use the holidays to go after an underserved audience - so long as you tie in the campaign to something relatable, as Budweiser did with nostalgia. 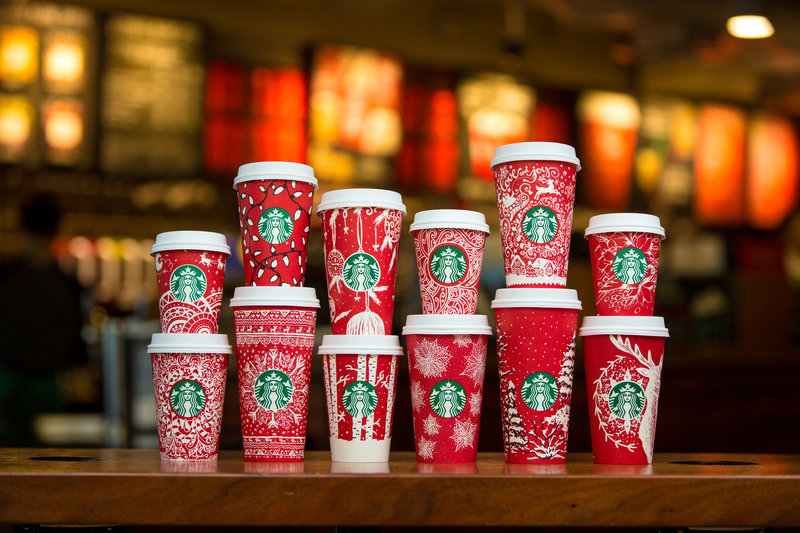 For years now, Starbucks has launched a holiday campaign built around its iconic red cups that are only available during the yuletide season. 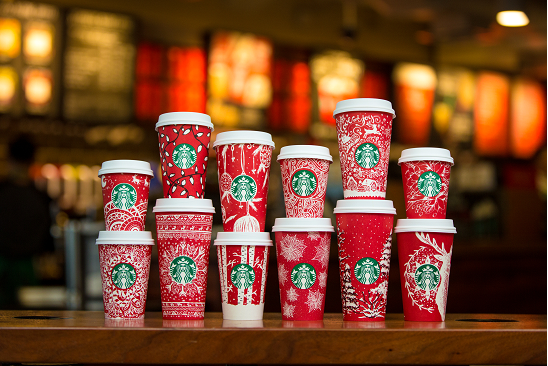 In 2016, however, Starbucks decided to let customers get imaginative and design their own red cups and post the results on their Instagram accounts. After receiving more than 1,200 submissions from six countries, the coffee giant chose 13 designs from customers throughout the world, including people who lived in Germany, Philadelphia and New York. The company then posted the winning cups on their social media channels during the season. But Starbucks went a step further and featured the winning artists and their designs on its official website as well, including bios and comments from the winners about how they came up with their designs. The campaign was brilliant, because it took a well-known product (red cups) and personally connected that product to thousands of Starbuck customers. Instead of the company offering something, customers were given the power to impact the company, knowing that their designs could potentially be featured on cups that would be shipped to 25,000 Starbuck stores in 75 countries. Find ways to turn the tables so that your customers can add something of value to your product or service. This not only connects them emotionally to your business, it can also make them feel as if they're contributing to your brand’s culture. Social media holiday campaigns are a great way to remind your audience what your business stands for beyond the marketing buzzwords. That’s why you have to plan these campaigns in a way that takes advantage of the themes of the season, but also ties those themes into your products and services in a seamless way. Holidays are about giving and sharing, so you're likely to gain the most traction when you create campaigns that give back to your customers and to your community, or place your customers in a position where they can do something charitable for those less fortunate. Worth considering in your holiday marketing efforts.